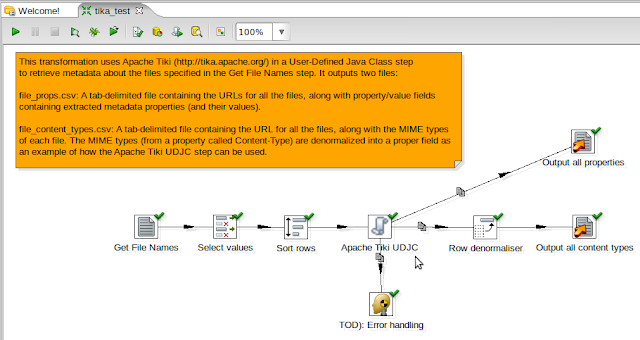 I recently stumbled across the Apache Tika project, which is a content analysis toolkit that offers great capabilities such as extracting metadata from various documents. Depending on the document type, various kinds of metadata are available. Some examples of metadata include MIME type, last modified date, author, publisher, etc. The first thing I noticed when I started writing the UDJC code to interface with Tika is that most of the useful code for recognizing document types and outputting to various formats is buried as private in a class called TikaCLI. It appears the current state of Tika is such that it is meant to be used as a command-line tool that can be extended by adding your own content types, output formats, etc. However, for this test I just wanted to be able to use Tika programmatically from my code. Since Tika is licensed under Apache 2.0, I simply grabbed the sections of code I needed from TikaCLI and pasted them into my UDJC step. Tika does a lot more than just metadata extraction, it can extract text from document formats such as Microsoft Word, PDF, etc. and it can even guess the language (English, French, e.g.) of the content. Adding these features to PDI would be a great thing, and if I ever get the time, I will create a proper "Analyze Content" step, using as many of Tika's features as I can pack in :) We could even integrate the Automatic Documentation Output functionality by adding content recognizers and such for PDI artifacts like jobs and transformations. The sample transformation is on GitHub here. As always, I welcome your questions, comments, and suggestions. If you try this out, let me know how it works for you. Cheers! Apache Hadoop 1.0.3 is not compatible with the Apache Hadoop 0.20.x line, and thus PDI doesn't work with 1.0.3 out-of-the-box. So I set out to find a way to make that happen. Then I started PDI and was able to use steps like Hadoop Copy Files and Pentaho MapReduce (see the Wiki for How-Tos). NOTE: I didn't try to get all functionality working or tested. Specifically, I didn't try anything related to Hive, HBase, Sqoop, or Oozie. For Hive, I'm hoping the PDI client will work against any Hive server running on an Apache Hadoop 0.20.x cluster, or any compatible configuration. If I test any of these Hadoop technologies, I will update this blog post. If you try this procedure (for 1.0.3, 1.0.x, or any other Hadoop distribution), let me know if it works for you, especially if you had to do anything I haven't listed here :) Cheers!